There were 600 million mobile broadband subscribers last year. By 2016 that should reach 5 billion. 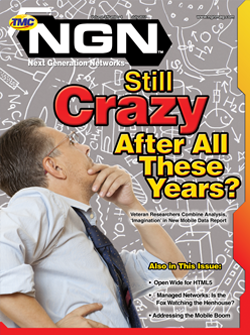 At the same time, as this month's NGN cover story notes, mobile devices and applications are becoming faster, more intelligent and, thus, more bandwidth intensive. Recently I came across the following definition of operational excellence: “It is the result of applying the scientific method to achieve the goal of a business.” That sounds simple enough, but what does it really mean in the context of discussing differentiation? It’s just shy of a year since AT&T gave up on the flat-rate, unlimited plan and industry observers marked the end to the mobile broadband buffet. In March of this year, Ralph de la Vega, president and CEO of AT&T Mobility and Consumer Markets, remarked how over the past four years the company’s data traffic increased by 8000 percent. Once upon a time mobile telephones burst on the scene. At first they were a luxury good. We charged by minutes, a few people bought them, and things were good, I guess. Hot Topic Managed Networks: Is the Fox Watching the Henhouse? The promotion of high-speed mobile broadband services is in full swing as evidenced by a flurry of new television commercials from U.S. mobile service providers. A recent ad shows how a sports event video is interrupted as a critical play is about to be viewed by a sports fan on his mobile device. The NGN Forum recently announced the technical working groups that will comprise the Smart Grid Forum. These new groups will cover smart grid topics such as M2M, NGN information technology, security, infrastructure and network management, green energy, applications development and business intelligence, and Advanced Metering Infrastructure. Mobile Musings The Future of Mobile Value-Added Services By TMCnet Special Guest Jim Machi | July 01, 2011 Share 0digg This article originally appeared in the July 2011 issue of NGN. From a pure business perspective, a mobile value-added service is an additional service for which subscribers pay extra. In other words, the service offers some kind of value, and the subscribers are willing to pay for it. There are a lot of queries on the Internet about using 3G and 4G networks to provide live streaming coverage from an event all the way to the viewer’s laptop or smartphone – without using wires – like the big TV networks do.